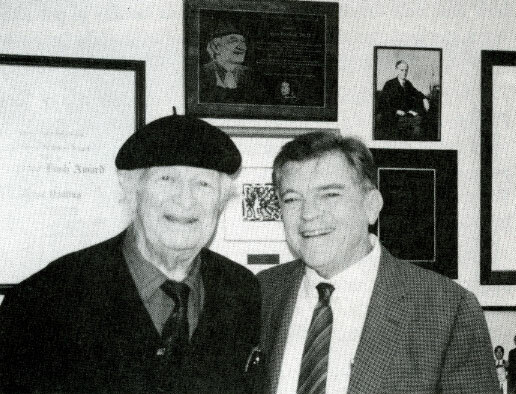 January 2013 marks the fifty year anniversary of the beginning of Linus Pauling’s libel lawsuit against National Review, an ideologically conservative opinion magazine that, at the time, maintained a circulation of about 100,000 copies. Pauling filed suit for damages of $500,000 for one editorial and damages of $500,000 for a second editorial. He pursued this lawsuit for five years in hopes of attaining recompense for statements made about him that he felt to be defamatory. 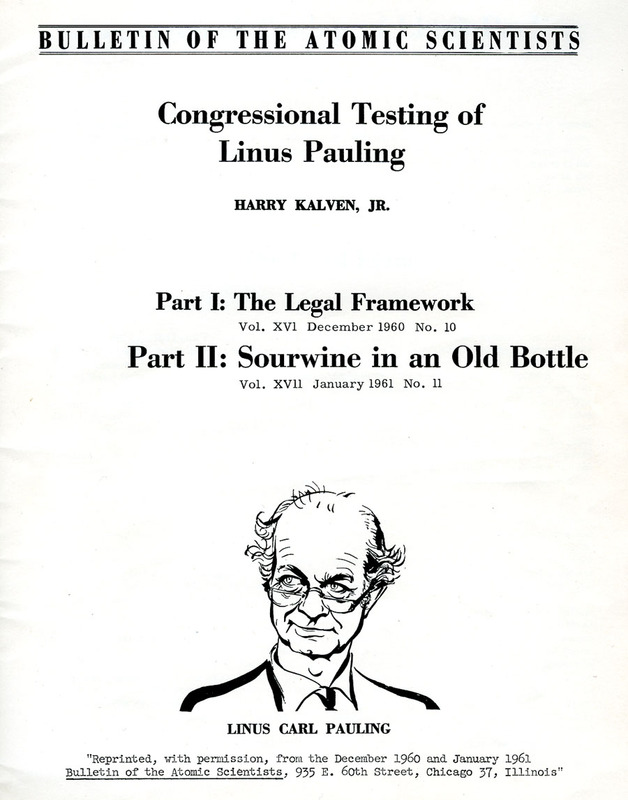 The suit proved to be lengthy, bitter and expensive, and its conclusion brought with it the close of a tumultuous period in Pauling’ s life defined in part by a great deal of litigation. 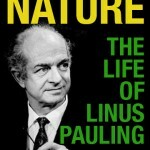 By 1960 Linus Pauling had become a controversial political figure. His importance in the international peace movement was cemented in 1957 when he wrote the “Appeal by American Scientists to the Governments and Peoples of the World,” a petition against nuclear bomb testing worldwide. Pauling, along with more than 13,000 other scientists throughout the world, signed this petition in an effort to curb the deleterious health effects that nuclear bomb tests were causing to humans. 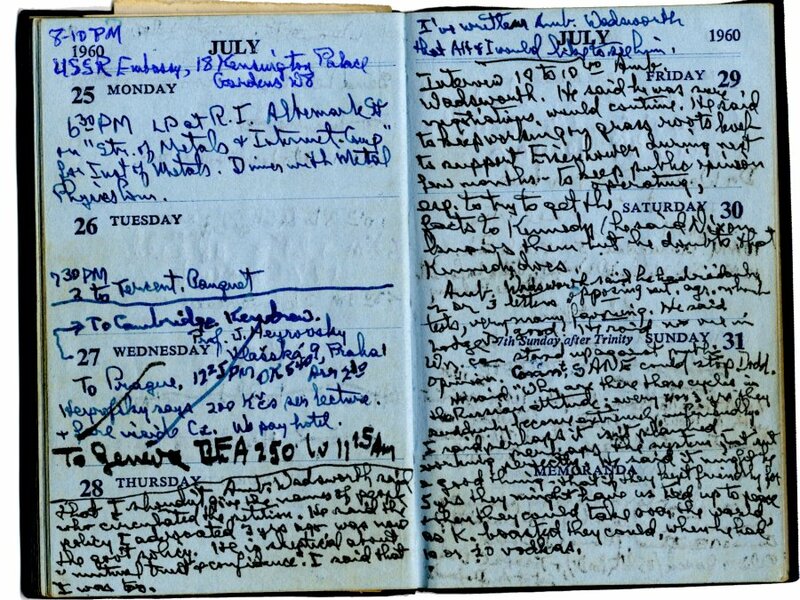 This effort resulted in Pauling’s receipt of the Nobel Peace Prize in 1963. Despite its success on the international level, the bomb test petition was controversial at home due to the conservative political climate of the time and the strong anti-communist sentiment prevailing during the Cold War. 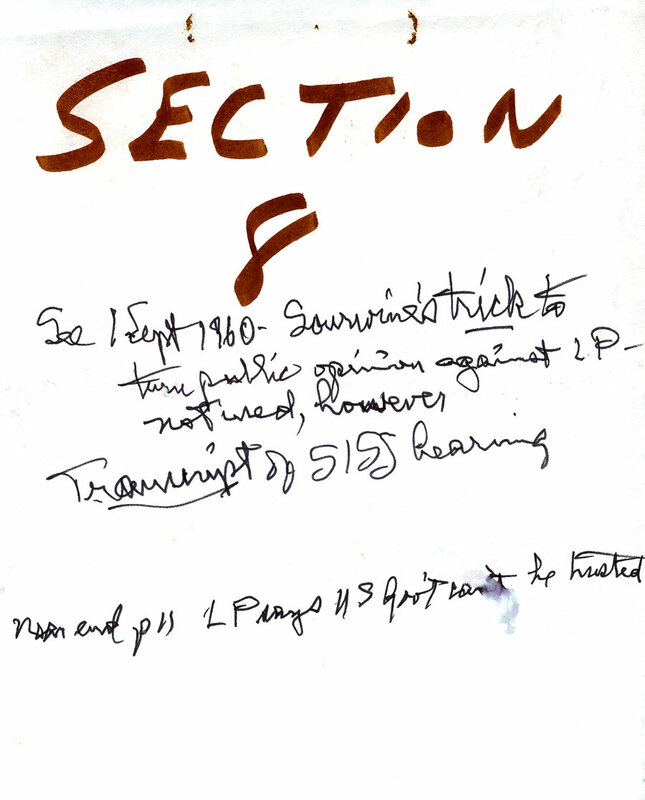 Pauling wished to collaborate with all citizens throughout the world on the petition, regardless of their governmental or economic system, a position that many saw as a potential threat to U.S. security. Indeed, in the eyes of some, opposition to nuclear bomb testing was equated with being a communist. The FBI began to monitor Pauling in 1950, when he became a contract employee of the US Navy. As Pauling involved himself more closely with the peace movement, the FBI likewise began to monitor his activities more stringently. 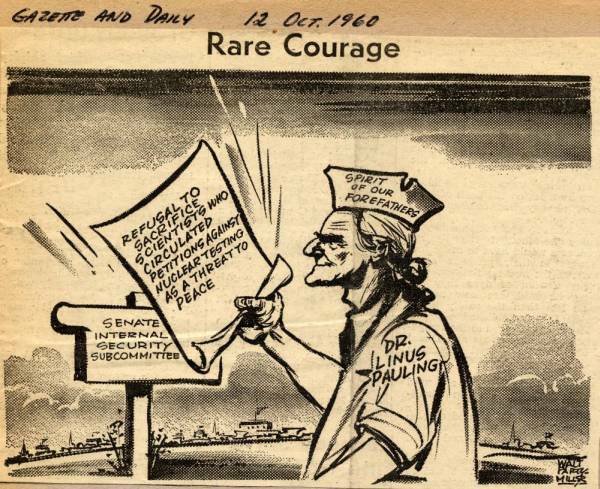 The Senate Internal Subcommittee also began to keep tabs on his peace work and ultimately subpoenaed Pauling in June 1960 to address his campaign against nuclear bomb testing, an activity that the committee suspected might be inspired by communist inclinations. The investigation infuriated Pauling, as he had never identified himself in that way and believed peace work to be vital to the prevention of nuclear war. Once the proceedings began, he risked a contempt of Congress citation and subsequent incarceration for refusing to release the names of the individuals who had submitted multiple signatures for the petition. He believed that divulging those names could be “used for reprisals against these believers in the democratic process,” and he refused to subject them to the same sort of harassment that he was facing. 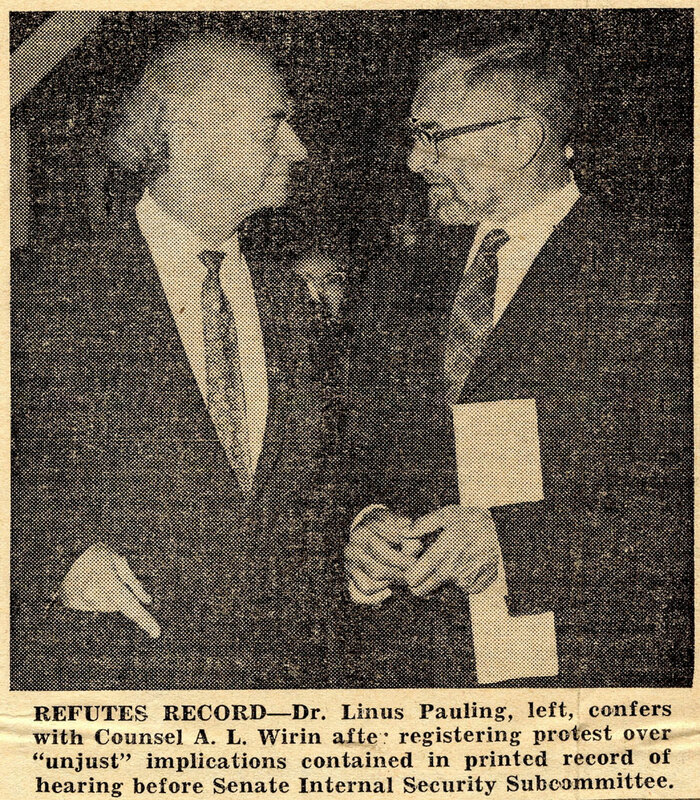 Pauling believed in the right to petition as a fundamental component of a working democracy and did not want the system to be curtailed “by representatives of defense industries who benefit financially from the cold war.” He took his stand and the risk ultimately paid off – the SISS committee backed down and contempt charges were not issued. 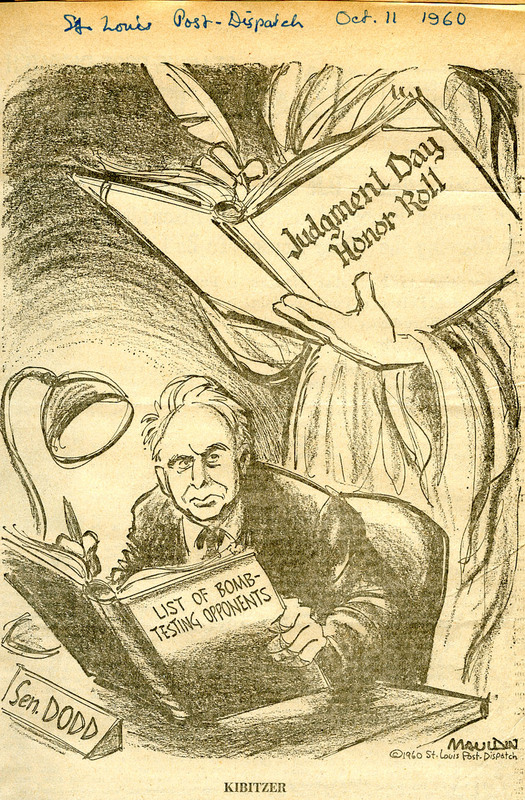 Despite Pauling’s dismissal by the committee, many articles continued to be published in newspapers and magazines around the country that decried Pauling as a communist supporter and criticized his refusal to release the names of the people who had help to collect signatures for the bomb test petition. 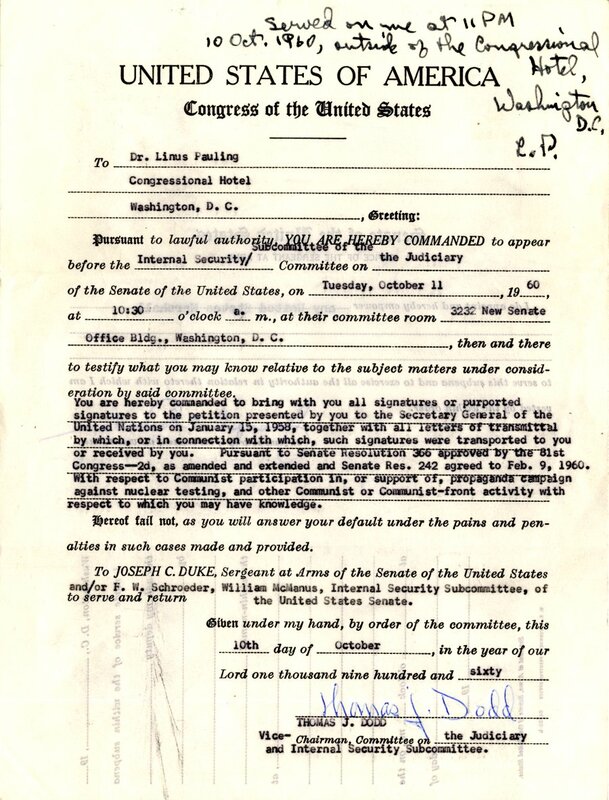 Linus Pauling is still at large and unindicted for his contemptuous refusal to give the Internal Security Subcommittee the facts about how thousands of names of scientists – including several thousand from Communist nations – were collected for his petition against H-bombs. 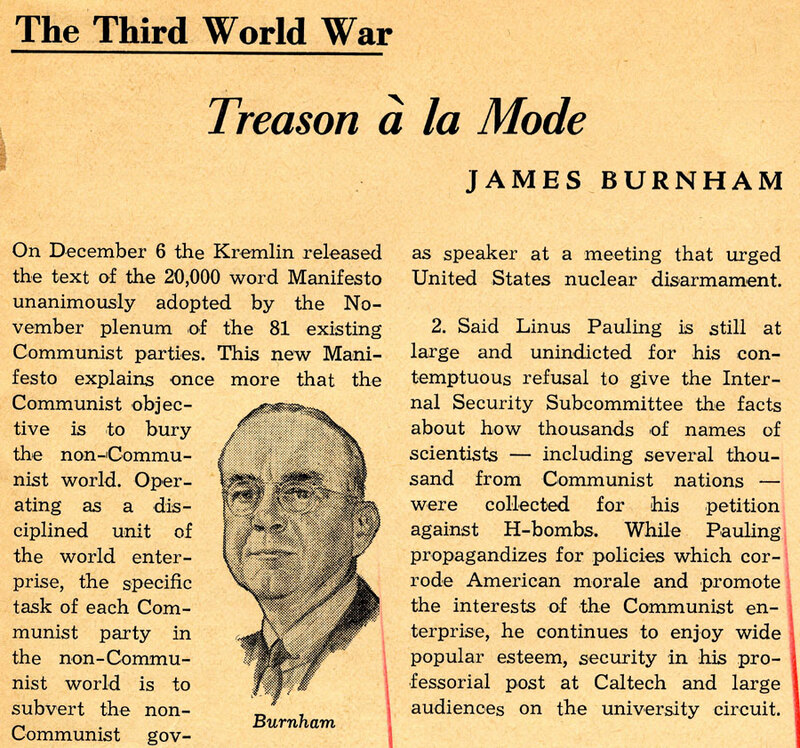 While Pauling propagandizes for policies which corrode American morale and promote the interests of the Communist enterprise he continues to enjoy wide popular esteem, security in his professorial post at Caltech and large audiences on the university circuit….The point is not whether these men are conscious traitors, which in all, or almost all, cases they are not. But the Communists are traitors. These men, by their acts, have condoned the Communist enterprise and advanced its interests. Our society, by condoning the actions of these men, condones also the enterprise. A year and a half later, National Review published a second article critical of Pauling, this one an editorial titled “The Collaborators,” which went to print on July 17, 1962. 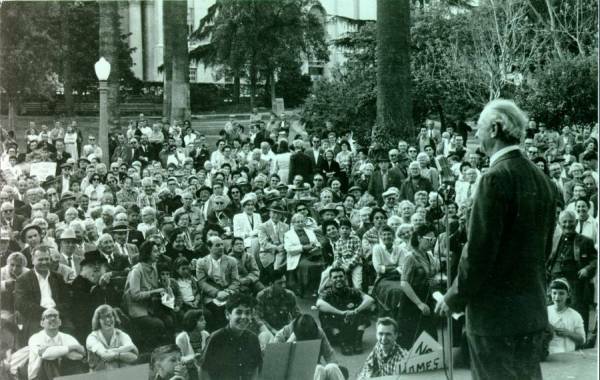 Professor Linus Pauling of the California Institute of Technology, once more acting as megaphone for Soviet policy by touting the World Peace Conference that the Communists have called for this summer in Moscow, just as year after year since time immemorial he has given his name, energy, voice and pen to one after another Soviet-serving enterprise. 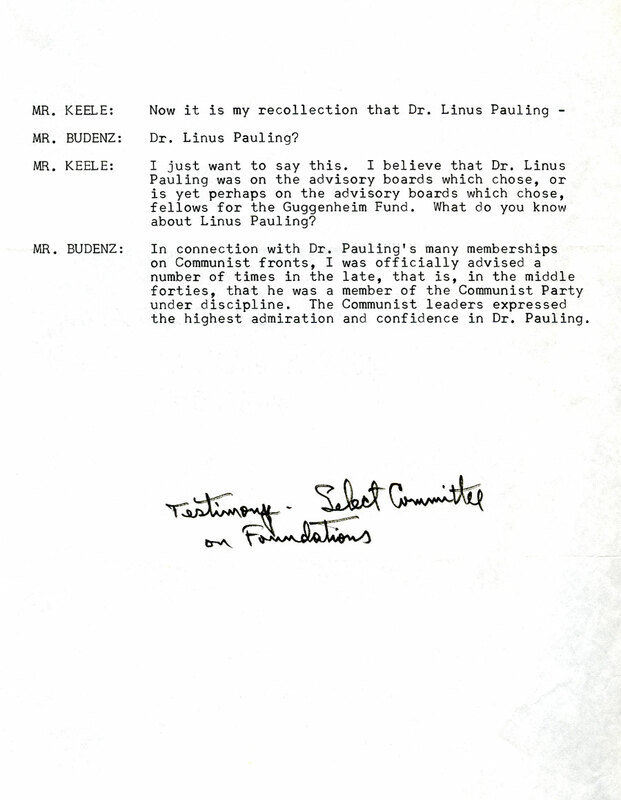 Pauling, unlike many Americans at the time, did not see the Soviet Union purely as an enemy and was not afraid of communism or its perceived consequences. On the contrary, he believed that the best way to ensure world peace and to promote the advancement of science was to form mutually beneficial partnerships between communities. Pauling maintained a cordial relationship with many Russians and traveled to the USSR six times, mainly to talk about science, but also to promote an end to nuclear bomb testing. 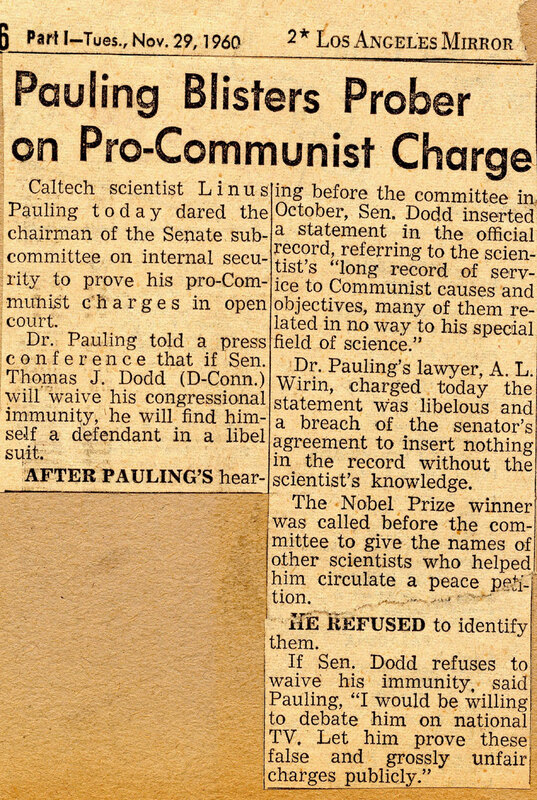 His inviting stance towards the Soviet Union was seen by some Americans as pro-communist and anti-American, but Pauling never identified as a communist and was a strong believer in democracy. By the time the National Review published its second article in 1962, Pauling had already successfully sued the Bellingham [Washington] Herald for a defamatory letter to the editor published on December 4th, 1960. This case was settled for $16,000 and a retraction was printed by the paper. At the time, Pauling also had three other court cases in motion: complaints against Hearst Publishing Co. and King Features Syndicate for $1 million, the St. Louis Globe-Democrat for $300,000 and the New York Daily News for $500,000. Excerpt from a list of reasons why Pauling’s “College Chemistry” was dropped from the curricula of various academic programs, 1954. Pauling worried that the deluge of articles attacking his reputation and labeling him a communist would decrease sales of his textbooks and negatively affect his position at Caltech. 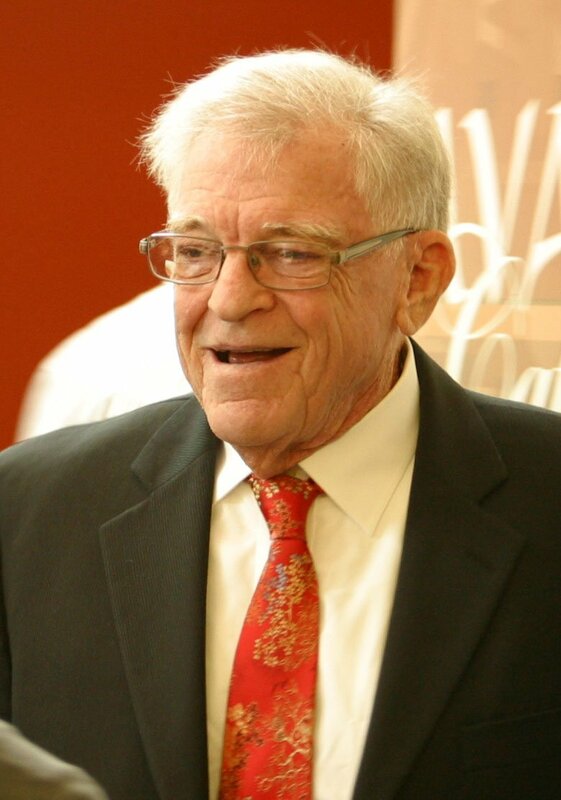 He later testified that libelous statements had cost him a raise from Caltech in 1962 and had resulted in his being treated coldly by the Caltech president and others on campus. He also testified that his book income had gone down slightly and that he had suffered a loss of self-confidence. 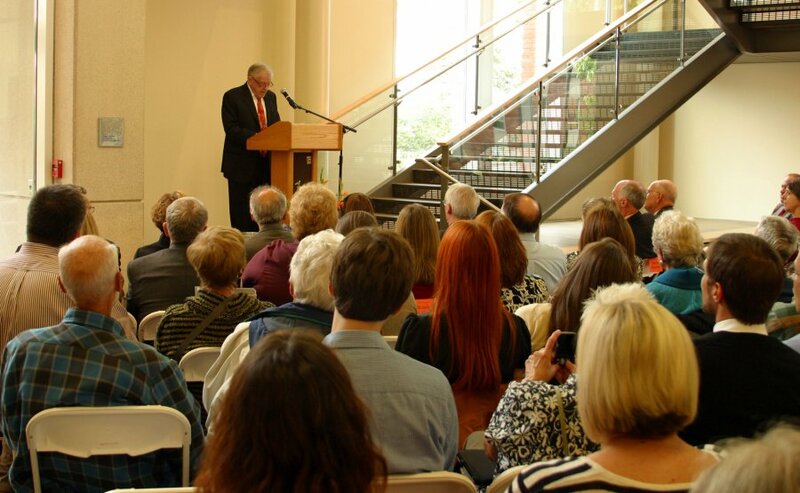 Determined to restore his good name, Pauling contacted the lawyer whom he had enlisted for the Hearst Corporation lawsuit, Michael Levi Matar, about the National Review articles. 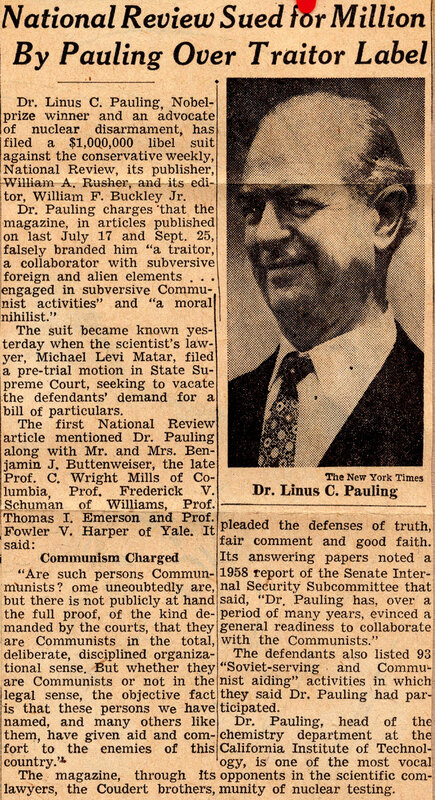 Matar replied that these articles had libeled Pauling “as a Communist and moral nihilist… [and there is] little doubt in your case that malice by these defendants would not be too difficult to establish.” The duo decided to sue the National Review for $1 million.